1. Regularly inspect the timber structure for signs of decay. If you’re timber balcony has structural timber that looks like the decking boards in the photo below, then it has advanced decay. Quite often it is easy to pick from a visual inspection. Brown rot is the most likely form of decay and it is brown and cubical in nature. It can look a little like irregular brick work patterns in the timber. Also hitting the structure with a rubber mallet can tell if there is decay. If there is a problem then the wood sounds hollow, while good wood has a nice meaty thwack. In addition probe around the timber with flat head screwdriver and rotten timber will be easily removed or quite soft in relation to sound timber. Photo courtesy of customer Brian. 2. If decay is present, determine if its superficial or more substantial. If you detect it softening then try and determine how much decay is present. You can drill a small hole and capture the shavings. If the wood is rotting the shavings will smell musty and crumble when rubbed between your fingers. Also the pressure required to drill will be less for rotting wood, so if its hard just under the surface then its superficial. If its soft all the way through then it will need replacement. Prevent anyone from using it until it’s replaced. Note that from the photo, the bearers in this case look sound, but contact a professional if you have any doubts on the structure. 3. If superficial, apply a presevative system to kill and prevent further rot. Lets get things straight. Preschem’s timber preservative products when applied correctly will extend the life of timber by preventing decay. However, they will not restore the structural strength of decayed timber. If you have a balcony with superficial decay then you can apply a products such as Preschem’s Timber Preserver and/or No Rot. When used correctly, the will extend the life of the structure by preventing the further biological damage. So it is a worthwhile investment and gives you of piece of mind. However, if you are unsure or suspect that the problem is significant, then immediately contact a building inspector or registered builder to assess it. This is by far the most important point that has to be made. If the decay is too great in poles, bearers or joists, then the strength has gone. 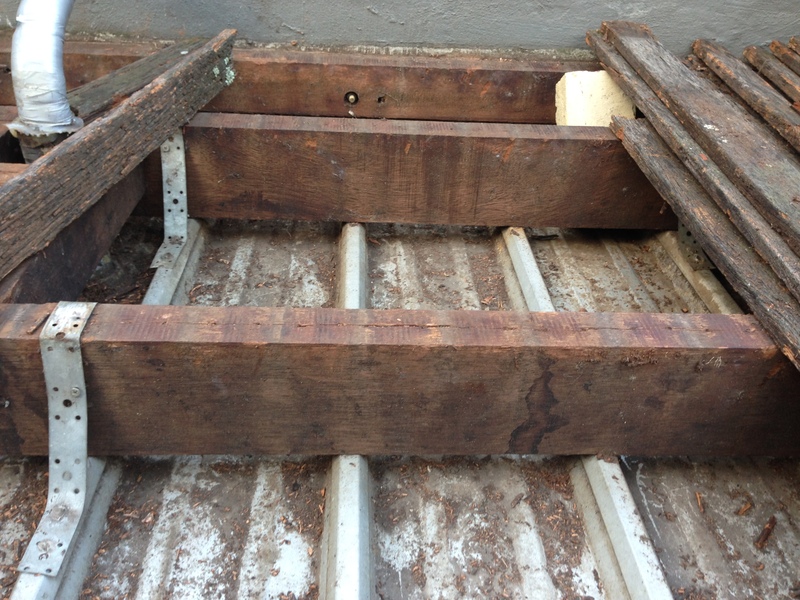 There is no product on the market that will restore strength of rotten timber so it will have to be replaced. *structural timber needs to be structurally rated. This rating is dependent on the type of timber, chosen, so consult your builder or building inspector as to the correct choice and size for your situation. 5. Make a diary note to inspect it again in 12 months time. Timber is a material that will eventually deteriorate over time through biological activity. Even if you have done all of the above in your maintenance, you will need to inspect your balcony on a regular basis. Make a diary note in the calendar on your phone to do it again in 12 months time. Have that note pop up and squawk at you on the day, then do it. It only takes 5-10 minutes but it could save you life. UPDATE (3rd April): Daily Timber News reports that Timber Queensland is now saying that the safest way to prevent deck and balcony collapse is for regular inspection. This is the most common sense approach for existing decks. The article goes further and states that “…the safest solution to combat potential deck and balcony collapses forecast by the Australian Institute of Architects is for homeowners to have them built by licensed builders”. Update (6th October): Preschem has recently become aware of wood preservatives or wood hardeners on the market that make the claim that they can completely restore the structural properties of timber. This claim is false and miss-leading. As stated earlier, there is no product on the market that will restore the strength of decayed timber. Rot degraded structural timber needs to be assessed to see if it’s still sound by a qualified professional building inspector or registered builder. Disclaimer: This article is for is general information only. Every situation is different so Preschem cannot stress enough, that if you’re not qualified to make this assessment yourself, then don’t. Contact a professional that will provide you with the correct advice on your specific situation.